This morning in the US Midwest temperatures are over 30 degrees below zero as the so-called polar vortex grips large parts of the country. The vortex is so cold it is said to be breaking records, causing transport chaos, cancelling many flights and trains, forcing shops to close and sadly also claiming some reported eight lives. 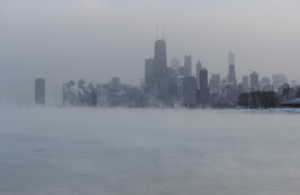 Lake Michigan has been described as a boiling cauldron, with sea smoke pouring off the lake. Indeed, it is so cold, that the town of “Hell” in Michigan has even frozen over. On a lighter note, people are sharing video content of their pants that froze in minutes, steam turning to instant snow and their pets wearing multiple layers of clothing. So what has all this cold weather got to do with a warming world? As I blogged earlier in the week, Trump the climate denier, deliberately confused the issue of climate and weather in a tweet earlier in the week. Despite Trump’s best efforts to call for more global warming, there is increasing evidence that climate change is causing the polar vortex in the first place. As the Arctic warms due to global warming, it is weakening the polar jet stream which normally keeps the cold air over the Arctic, and therefore it moves south over the continental US. Although this is an active area of research, over the last year there have been new scientific studies which point to the fact that climate change is causing episodes like the one being experienced by large parts of the US right now. As one paper in Nature published last year stated: “Using a recently developed index of severe winter weather, we show that the occurrence of severe winter weather in the United States is significantly related to anomalies in pan-Arctic geopotential heights and temperatures.